A lighthearted assessment of the medical, psychological, social and sexual aspects of conception shares advice for women on what they can do before contacting a doctor, explaining how to prepare oneself mentally and physically for pregnancy while offering insights into maximizing conception chances. Original. 35,000 first printing. For more information, please read How they can boost their fertility and get pregnant faster? Don't worry about reading the pregnancy books yet, as it's pretty normal for it to take a while for you to get knocked up. I highly recommend reading Taking Charge of Your Fertility - it explains how to figure out when your fertile window (which is tiny!) actually is. And I love The Impatient Woman's Guide to Getting Pregnant , as she looks at the actual scientific research behind most common TTC things and it'll help when you have questions or things that you fancy trying. O-2 is one of the most fertile days, so you're not out yet! > Most books, Internet sites, and OPK or fertility monitor instruction sheets say that the day you ovulate is the most fertile. But the latest research, based on four different studies, shows that the most fertile days are one and two days before ovulation. For women in their late 20s and early 30s, the chance of getting pregnant on the day of ovulation is less than 1 in 10, but two days before ovulation it’s 1 in 3— three times higher! Not just "better than nothing" - O-2 is one of the most fertile days! General advice - join /r/TryingForABaby! And realize it may not happen as quickly as you'd hope. > How much should you exercise when you’re trying to get pregnant? Welcome to yet another topic that’s generated lots of controversy. Women who exercise a lot— really, really a lot, like professional athletes and marathon runners— often have impaired fertility. Sometimes they stop getting periods entirely or have a short luteal phase (the time between ovulation and your period). But what about hitting the gym on a regular basis? That can increase your fertility, partially because it helps you keep your weight down. > One study found that women who engaged in “vigorous” exercise five or more hours a week were 40 percent less likely to experience ovulatory infertility; two to five hours per week lowered the risk 13 percent. Even when weight was taken out of the equation, exercise benefited fertility, with 33 percent less ovulatory infertility among those exercising vigorously five or more hours a week. So what does “vigorous” mean? A few examples: walking 5 miles an hour or faster; jogging or running; bicycling more than 10 miles per hour or going uphill; using a stair climber machine at a fast pace; swimming laps; circuit weight training; playing soccer. (One list I found had fun entries like “square dancing— energetically” and “clogging.” Does that refer to shoes or beating? Or beating with shoes? It also listed “rugby,” which you probably don’t want to indulge in when you’re trying to conceive.) The study found that “moderate”-intensity exercise (slower walking or bicycling, nonlap swimming, playing softball, gardening, housework) didn’t impact fertility. Keep in mind, though, that this study only looked at infertility due to ovulatory issues— just like the one with food. > Nevertheless, exercise might benefit you. It’s a great way to lose weight if you need to and an excellent mood booster. And you might end up exercising by chasing around a couple of kids. I'm 35 and seven weeks pregnant. Whenever anyone mentions concerns about age and pregnancy, I always link to this article. > The widely cited statistic that one in three women ages 35 to 39 will not be pregnant after a year of trying, for instance, is based on an article published in 2004 in the journal Human Reproduction. Rarely mentioned is the source of the data: French birth records from 1670 to 1830. That fact blew my mind! 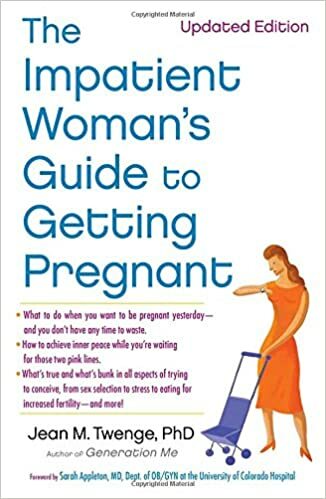 I also highly recommend reading The Impatient Woman's Guide to Getting Pregnant , as she looks at the various pregnancy stats (like the fertility "dropping off a cliff after 30" etc) and goes back to the original research to find out what is real and what is scaremongering. I recommend reading The Impatient Woman's Guide to Getting Pregnant , as she looks at the actual scientific research behind most common TTC things. > Acupuncture doesn’t seem to improve women’s fertility, at least in IVF cycles. Initially, a few small studies suggested acupuncture might increase IVF pregnancy rates, but a large review of all of the studies showed acupuncture didn’t make much difference. In seven studies of 1,601 women undergoing IVF, 32 percent of those who had acupuncture gave birth, as did 29 percent of the control group. The authors of the review concluded, “There is no evidence of benefit for the use of acupuncture in IVF treatment.” I think it’s more fair to say that there might be a very small benefit. The most recent study on IVF and acupuncture, too new to be in this analysis, also found no effect. After 35, things can start to get more complicated, but 40 is the "now or never" time. I'm 35 and nine weeks pregnant. Whenever anyone mentions concerns about age and pregnancy, I always link to this article. I highly recommend reading The Impatient Woman's Guide to Getting Pregnant , as she looks at the various pregnancy stats (like fertility "dropping off a cliff after 30" etc) and goes back to the original research to find out what is real and what is scaremongering. Not just "can occur" - 0-2 is one of the most fertile days!